Feb 17-26: Go see Annie Warbucks at Heart of Harnett Playhouse! Annie Warbucks is coming to Harnett County at the Heart of Harnett Playhouse. Performances will be February 17, 18, 19, 24, 25, and 26. About the play: The world’s favorite orphan returns in Annie Warbucks, the sequel to the international smash hit Annie. All the ingredients that made Annie so successful are here once again, with an old-fashioned romance thrown in for good measure. “THE SOUND OF MUSIC” auditions will be March 5 & 6, 2012 at 7:00 P.M. at the Stewart Theater. Casting will be for ages 5 years old and up. Please be prepared to sing at least 16 bars of music in the style of the show (showtune), read from the script at the director’s discretion, and perform a routine that the choreographer will teach at the audition. Performance dates will be May 11-20, 2012. Please bring a list of conflicts with you. Conflicts will play a vital role in casting. Please consider them before auditioning. Absences will not be allowed after May 1st, 2011. Buy your tickets NOW for December’s Disney on Ice! Tickets are now available to the general public for Disney On Ice ‘s Dare To Dream. We have gone to one of these shows in the last few years and really enjoyed it! The Disney On Ice Dare to Dream 2011 show is coming to Fayetteville’s Crown Center Expo on December 15-18, 2011. (If you’re interested in a bigger venue, it will be at the RBC Center December 7-11). Get tangled up in the newest thrilling show to hit the ice, Disney On Ice presents Dare to Dream. Experience Disney’s hilarious hair-raising escapade, Tangled; boogie to the bayou beat with Princess Tiana and Prince Naveen from The Princess and the Frog, and see dreams become reality as Cinderella meets her Prince Charming. Experience the beauty, sparkle, and spirit as all your favorite princesses take to the ice at the ultimate Disney Princess event of a lifetime! December 15th and 16th at 7:00 P.M., December 17 at 2:00 P.M. and 7:00 P.M., and December 18 at 2:00 P.M.
Order tickets online at www.ticketmaster.com or charge by phone at 1-800-745-3000. Check out the Disney on Ice website here for more information. 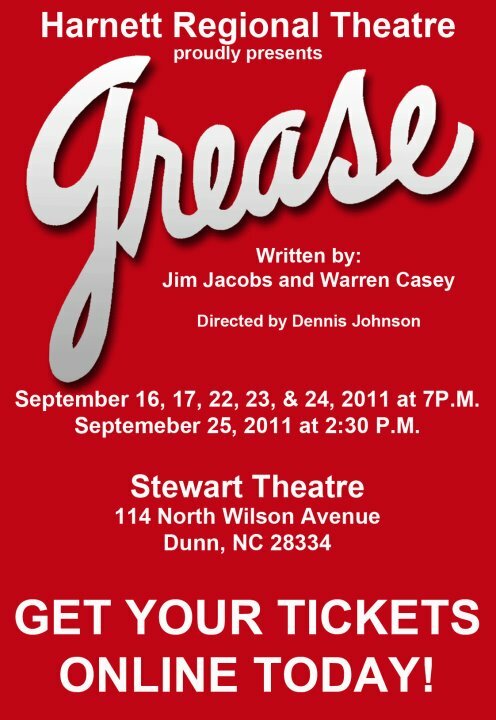 Visit Harnett Regional Theatre’s website for more information, to get your tickets, etc. at http://www.onlinehrt.org/ ! Is your child interested in acting? The Heart of Harnett Playhouse is holding auditions August 15-17 at 7:00 P.M at the theatre in the former Lillington High School Building. There are many parts available for youths age 5-18 (as well as adults). Performances will be October 21, 22, 23, 28, 29 and 30.